My life is always on the run. I just finished my Theater Arts classes in Manila two days ago. We have been away from our Novitiate House since April 15, 2009. We had our 15 days Summer Mission in outstation, then went to Manila for our Pauline Month talks and classes. Now, I am in Lipa City Novitiate House. 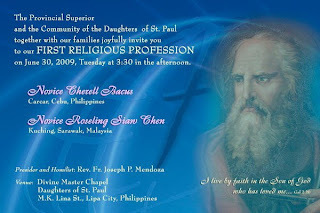 This is her invitation to her First Religious Profession in Lipa City on June 30, 2009. This is a happy moment as I recall Sr Sylvia, FSP requested me to sponsor Roseling to the Philippines for her religious vocation. I met her before she left for Philippines and promised to pray for her until she takes her FINAL Profession, that was a promise of 12 years' prayers! May God bless her and fill her with His love always. Uncle, do you have a blog? Alyssa Uncle outside.. later give you my address. To build strong Faith Foundation, we need to go well beyond the text book and the class room. The LSS, the Youth Gatherings, the Mt Singai Summit, Mt Hosana, Christmas Carolling etc. Daily prayer too, of course, and don't forget the ROSARY, very important. The Rosary is The Weapon against all evils.